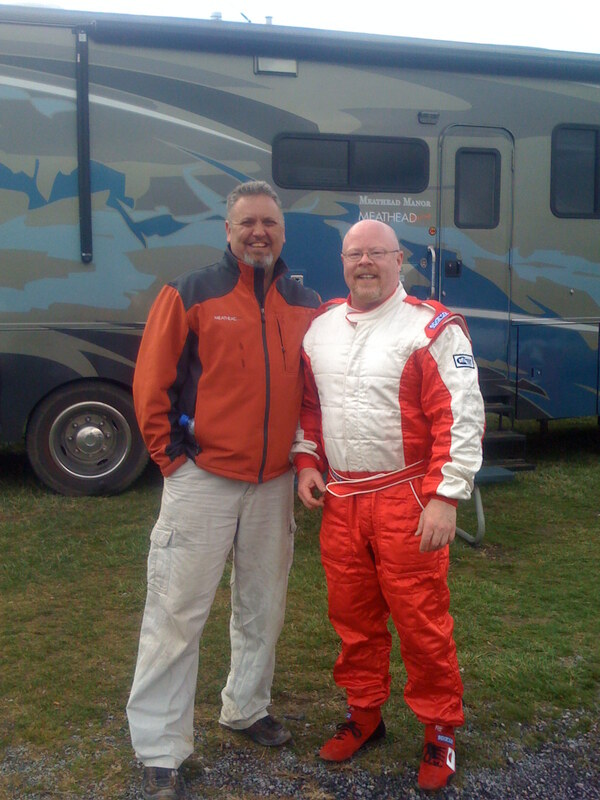 I am not an officially licensed SCCA race car driver – yet. Actually I am a “novice” and will need novice strips for my first two races. Assuming I pass those without hitting other cars or being in the way, I will gain my full SCCA regional drivers license. 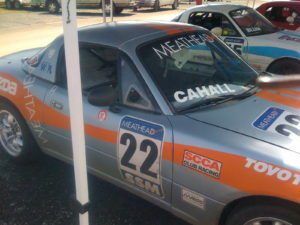 Many thanks to Mike Collins of Meathead Racing for helping me through this process. Mike knew the ropes, rented me a car, and likely had to put in a good word for me as I missed a few flags (including the RED flag) and spun out a few times on day two. Here is a shot of Mike Collins and myself. Click on the photos to see them full size. I got news this week that World Class Driving (WCD) needed to cancel the 200 MPH session I was registered for on April 7th. It seems that they did not have enough participants to fund the event – so they tried to push me up a couple of days to April 5th. Unfortunately my schedule for April 5th was already booked at Summit Point for SCCA Club Trials. So now I will need to wait until December for the next 200 MPH event. Getting my practice in for the SCCA and doing more networking with those people is far more important than making it down to Miami for a one-shot deal. I still have the opportunity to drive some Ferraris and Lamborghinis out at Virginia International Raceway (VIR) on May 21st. 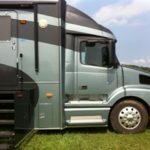 One side benefit of this cancellation is that WCD gives a $1000 discount for the 200 MPH program to members that have participated in a previous event. Since the May 21st event will now come first, I get the 200 MPH event in December for $1000 less. I remeber back to my days at the University of Illinois at Chicago computer center where I was a consultant to the student popluation regarding all of our computer systems. As I learned more and more, I realized just how much I did not know. In other words, the more I knew, the more I realized how little I actually knew out of the vast world of computer science, programming languages, operating systems, etc. I became curious as to if I would close this knowledge gap or see it widen as more technology was developed. It was another type of race – a race into the information age. I had the same feeling for a while as I attempted to figure out how to begin wheel-to-wheel competition racing with the SCCA. Getting my Novice License and being signed off to race was one hurdle. This was complicated by a coast-to-coast move from Seattle to Northern Virginia. The next hurdle was getting my 2001 Z06 Corvette prepared to race. I have e-mailed a number of people and talked with some as well. Most of those people were involved in the SCCA as Time Trials, Solo or PDX participants. As I have now learned, they might as well be from some other racing program or another planet. The rules for “club racing” are the most stringent and complex. 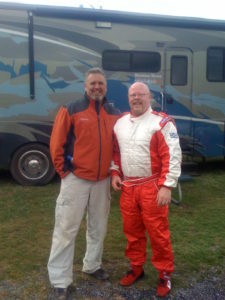 On Monday morning I was fortunate enough to have the SCCA TCS T1 class driver sponsor call me. She was very patient and polite (thank you Pam). She let me know I should have started with the program office and found my way to her first. Needless to say, between her and the head of tech inspection, it is very clear to me that I need a full roll cage. So onto PiperMotorsport to have that done when they can schedule me in. I also learned that I need to have the full roll cage for the SCCA driving school I am registered for on March 27th. There is no way it will be done then – so I am going try to rent a car with a roll cage for that event. It hopefully will be a Mazda Miata – or what they call a “spec” Miata. One other somewhat interesting factoid I learned was that my “lowly” TCS T1 class runs simultaneously with all othe other “big bore” classes (ie. on the track at the same time). I had heard I would likely be the only T1 car in my class. I had thought I would have the track to myself! This was a bit of a suprise to me since I thought at worse I would only be out there with other cars from my T1 class. Pam informed me that I would be out there with GT1 class cars and some cars with over 700 HP. How ironic – I will probably finish last in the actual race and get a trophy for 1st place in the T1 class (and 2nd place, and last place). I definitely do not want to be driving a car with 700 HP yet – so I need to be ready to passed a whole lot by all the other cars on the track. No pride here. Just glad to be able to learn and rub elbows with these highly experienced die-hard racers. Drat! 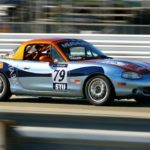 Just when I thoughts I was in the running to complete preparations for my first real season of racing in the SCCA, I find I had some bad information on the requirements. It seems I may need a roll cage for the TCS T1 class that I plan to participate in. It was hard enough to buy seats that fit (that took three different sets through trial and error) and finally get them installed. Please note that both of the previous two sets stated that they fit the 2001 Corvette Z06. I guess they assumed you did not want to close your doors, roll up your windows, etc. Roll cage! Now we are seriously drilling holes and welding stuff to the car. No more going back to selling this as a Corvette driven by a little old lady from Pasadena to go back and forth to church on Sundays. It will be clear this car had definitely seen some track time. Oh well, after GM goes out of business, maybe it will be a collector’s item. Nothing like a little added stress towards maintaining that delicate “work / race balance” – especially with work being so calm and constant at AOL over the last few weeks. One of my cats is sick too – so it only makes sense that the racing hobby throws me a curve ball just to keep things all in perfect harmony. Oh well, I know I can use this car (if not in the shop getting the roll cage) or my newer 2006 Z06 Corvette for the Saturday April 4th SCCA Performance Driving Event (PDX). I will also be OK testing out the new Ferraris and Lamborghinis with World Class Driving even if I cannot get this beast race ready. So at least the whole summer will not be a bust for going fast. The trials and tribulations of the need for speed. 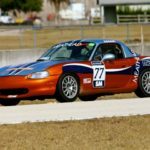 While continuing my saga of preparing for my 2009 MARRS/SCCA season, I have completed another step of transforming my 2001 Z06 Corvette to meet the SCCA GCRs. I now actually have put the passenger side Corbeau Racing Seat into the car along with the fire extinguisher. While none of this applies to my future attempt to drive over 200 MPH, it is all required if I am going to race my own car this summer while attempting to maintain that precious “work / race” balance. Please note that the “harness bar” that runs behind the seats for the top two belts of the 5 point belt was already installed for me at Tony’s Corvettes. Similarly, the harness connections down by the lap belt connectors was also installed there. I do not have any pictures of me removing the old seat. It was done long ago on the previous attempts of installing Sparco seats into the car. Below is a shot of the car without the seat in it. Note the four bolts sticking up from the floor. These are the bolts that the new seat will bolt down on. The fire extinguisher is attached to the two front bolts in this picture. I do have a shot of the old seat next to the new seat before it went in though. This allows some comparison of height, width, etc. I ordered two different brackets (driver and passenger) for the identical seats. The main difference between the brackets is a connector for the “inside” lap belt connector. Clearly the inside of the bracket is different for a driver or passenger seat (left or right). In this case “inside” means towards the middle of the car versus the lap belt connector out near the door. The bracket simply bolts onto the bottom of the seat with four bolts that come with the seat. Below is a picture of the seat after the bracket was bolted onto it. The lapbelt and inside belt connector need to be attached to the seat. They can be seen on the side of the seat below. The new safety harness connector is the solid metal part and the block part is to the old lap belt. The photo below shows the connector for the leg belts being connected to the interior side of the seat. This has to be done before you install the seat or you will never be able to connect it. The result below shows that the leg belts are now sticking out of the middle of the seat. This is the main part of the 5-point harness system as it contains the buckle that all of the 4 other belts (2 shoulder, 2 waist) will connect into. Bolting the system to the floor all happens at once. The seat is installed onto the bolts. The fire extinguisher is bolted to the front seat bolts and the harness bar support is connected between the outside rear seat bolt and the harness bar above the seats. From there it is as simple as tightening the four bolts. This is as simple as taking the belts and attaching them to the connectors on the harness bar and the other connectors. Finally! Sit down, buckle up, and hold on! Or at least pretend to since I am in the passenger seat and no one is driving. Most of this was extremely straight forward – aside from the fact that the lapbelt connectors and harness bar were already done by Tony’s Corvettes. 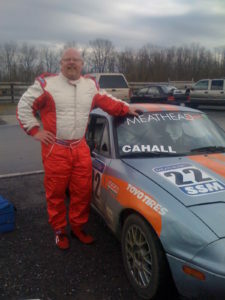 In addition to preparing for the 2009 SCCA season, I also plan to take part in a couple of events put on by World Class Driving. It is all part of maintaining that “work / race” balance I referred to earlier. The event that first caught my eye was through and ad in United Airline’s Hemispheres magazine. The title of the ad was, “Break the 200MPH Barrier!”. Their web site calls it, “World Class Driving XTREME“. It is held in Miami this year in April and December. I am registered for the April session. Most people in their lives would never even want to do such a crazy thing as break the 200MPH barrier. For the remaining few that actually do think it sounds exhilarating, the possibility of a) owning a car that can do it, b) finding a place where you will not kill yourself, and c) remaining within the laws – is pretty small (if not zero). The fastest car that I own is a 2006 Corvette Z06 which is “only” rated at 190+ MPH top speed. So that eliminates me pretty quickly from this club. Furthermore only a few highly skilled race drivers have the talent to take a capable car over 200MPH on a banked oval (go try it sometime if you think you are Mario Andretti). So, this relegates the average (or slightly above average) schmoe like me to trying this in a straight line. Even really fast production cars barely get above 130 MPH in a 1/4 mile dragstrip. 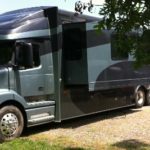 So where can us “weekend warriors” have a chance of hitting 200MPH even if we could rent the proper beast? Voila! Abandoned airstrips across the US should work nicely if you can get access. The one World Class Driving uses down in Miami is 11,000 feet (over 2 miles) long – plenty of room to make it to 200MPH and back down safely. Let all of the legal issues be part of World Class Driving’s responsibilities. That is a much better idea than sneaking a Lamborghini from a dealer “test drive” onto some abandoned airstrip! Although I must say I was very pleased that Lamborghini of Washington let me test drive one of their Gallardos – but that is a story for a different time. It will be the first time for me in any of these cars – although the Super Leggera is just an improved model of the Gallardo that I mentioned above. The training specifies that you will get to try five of these cars throughout the day. Many of these cars are nice additions to the autos I will get to test in April down in Miami. If anyone gets inspired to register for one of their events, please use my Ambassador Reference code: fa63280f. I think I get some bonus points or something if you do. Here is a video of some of the cars making their 200MPH runs.